For a brief, fleeting moment, it seemed that this time it might be different. Donald Trump’s inauguration was followed by the largest one-day protest in American history. The next week, spontaneous actions broke out across the country’s airports in response to the administration’s travel ban. People started talking about a general strike. That was then. This is now. The upswell of political action that began three and a half months ago continues, of course, as congressional representatives meet with angry constituents across the nation and every weekend brings a fresh march, action, or protest. 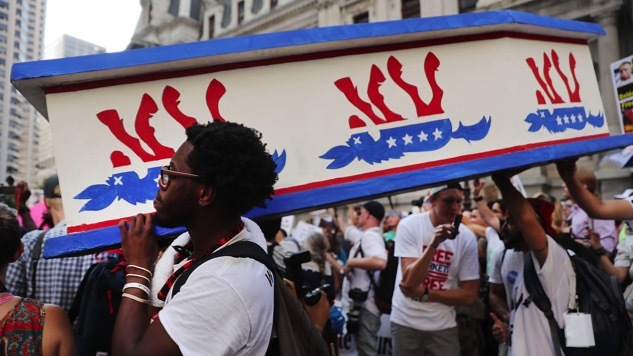 But today, unlike in the immediate aftermath of the inauguration, the protest movement is becoming branded by the big blue D of the Democratic party. That presents a problem. The reason that there’s a saying that “the Democratic Party is where social movements go to die” is because it’s true. America’s second most enthusiastic capitalist party finds its purpose in crushing challenges to the socioeconomic order by co-option and assimilation. The Democrats were flailing after their crushing defeat last November. Their electoral machine was in shambles and they were all out of ideas, after having tried nothing. It took a while for the party to read the mood of the electorate. Senate Democrats, with the exception of New York Senator Kirsten Gillibrand, were mainly compliant with confirming Trump’s cabinet nominees in the first week of the new administration. That began to change, however, as the public pressure from a genuine grassroots movement pushed back against the Trump agenda. Senators Elizabeth Warren and Cory Booker stopped voting for the president’s Cabinet picks by February. They knew there would be consequences for collaboration. Gillibrand, Warren, and Booker are each widely expected to have designs on the White House in 2020, and they each want to turn the new protest movement to their advantage. Booker showed up at an airport protest on Jan. 29. Warren and Gillibrand have popped up at rallies across their home states in the months since Trump took office. Their votes against Trump’s nominees appear, to a cynic, to be the kind of politicking that will position each well to channel the anger against Trump from the base while defanging the parts of the movement they don’t care for. As for Clinton, she has reentered the political scene with both a new narrative and a new scheme. The failed 2016 Democratic presidential candidate has decided that she is mostly blameless for her defeat. Instead, the new narrative goes, Clinton was brought down by now former FBI Director James Comey and an unspecified but nefarious Russian hacking operation. This move by Clinton encapsulates the problem of the Democrats coopting an organic protest movement against Trump perfectly. A real grassroots movement against the president and his administration could present a challenge to both the problems of the current administration and the problems of America as a whole. But if the movement is controlled and funded by the same party professionals that have created a brand so off-putting, and so toxic, that the American people prefer Trump, what measure of success can it realistically expect to have? Further, a Clinton controlled PAC could allow the party machine to continue to determine the course of the movement. The Democrats have deep pockets—ask anyone who’s ever run against the party without significant financial backing. By funneling extra cash and resources to her chosen candidates, Clinton and her ilk could continue to control the direction of the party. Sure, a few more liberal candidates would slip through the cracks in the primaries. But for the most part, we shouldn’t expect to see a Tea Party wave in the Democratic Party in 2018. They won’t allow it. The Democrats plan to attach themselves, tick-like, to a political movement that was born from resistance. They’ll drain it of its lifeblood and infect it with a debilitating disease, rendering the movement toothless, tired, and depleted. It’s up to us to make sure that doesn’t happen. You can follow Eoin Higgins on Twitter and find him at Patreon.